Sri has worked with MCIS for nearly 9 years as a freelance interpreter and translator. 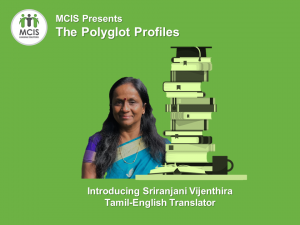 She currently does translation work for MCIS, while working as a Tamil language instructor and assessor for the Toronto District School Board. At our 2018 Annual General Meeting, Sri was awarded the ‘Translator of the Year’ award for outstanding dedication to MCIS and the profession. 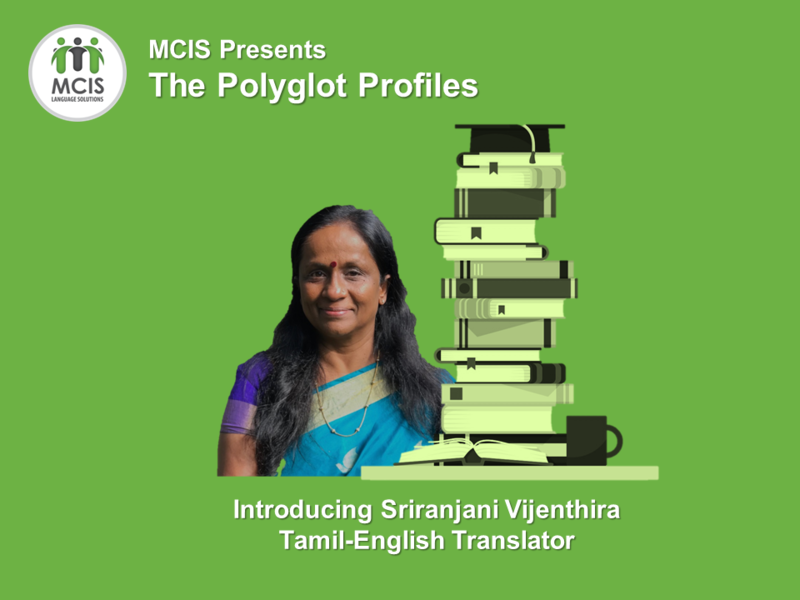 Thank you, Sri, for your continuous passion and hard work at MCIS, and for taking the time to work with us and contributing to #ThePolyglotProfiles. In Sri Lanka, I was a high school biology teacher, and I loved it. However, when I moved to Canada in 1992, I wasn’t able to stay in teaching. I had various jobs, such as being a teaching assistant in computer technical support and also worked in the pharmaceutical industry. Then in 2009 a friend told me about MCIS’ interpreting course, and my family encouraged me to try it out. At first, I was nervous; I didn’t know if I would like it, or even be good at it. Once I began working and gaining more confidence with it, I realized that I really enjoyed the work and was learning a lot. It made me very happy when my interpreting work was complimented by service providers. The opportunity for translation knocked on my door some months later, when I attended MCIS’ 2010 AGM. There, I was asked if I would be interested in translating for MCIS. I have since been developing my skills through workshops, and am currently enrolled in the MCIS translation course. I also completed an MA in Tamil this past August. I’ve always had an interest in languages – I love to read and write and have been writing since I was in university. I’ve actually published nine books, including short stories, essays, and workbooks for learning Tamil. And despite this passion for the Tamil language, I never realized that interpretation and translation were viable occupations. I never thought that I would end up in the language services industry or become a language service professional. In fact, I wish I’d focused on translation earlier, when I first came to Canada. I’m very happy that I chose this field eventually, because I take pride in my work. This field has also given me the freedom to take control of my life for the first time since moving to Canada from Sri Lanka. What’s the best part about being a translator? Translation helps people communicate. I’m proud to be a translator because my work helps people learn new things, gain awareness of situations, navigate various systems, stand up for their rights, and so much more. My job is never boring, as it covers a range of topics, so I’m constantly learning new things. I enjoy making text flow and finding creative ways to deliver a message, and I’m happy that I can do it in my own time. All this makes being a translator very fulfilling. Where do you see the future of the language industry and the role of translators going? There are many immigrants coming to Canada, so there are more and more people in the country who don’t speak English and who require translation services. Translation helps cultures understand each other. Though some organizations use machine translation to reduce costs and deal with this increasing demand, machines aren’t always good enough. Humans can add creativity and ensure a meaningful understanding. Talented writers can think about the intended audience, and write in a way that the specific audience can understand. It’s also worth noting that machines cannot always translate idioms or proverbs, and they cannot add cultural translation either. There is also the fact that some agencies are outsourcing translation work to other countries to save money. But, only Canadian translators can understand the Canadian culture and context. So, I have to believe that there will always be a demand for translators in this globalized world. If you’re thinking about becoming a translator, don’t hesitate, just go for it! Once you’re in the industry, remember that translation is a lifelong practice. It requires keeping up not only your language skills, but also your knowledge of subject matters and culture, so that you really understand the industries and fields that you are working in, and so that your translations are easy to read and to understand. It can be hard work, but it’s worth it!